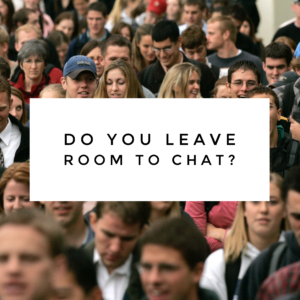 Home/Posts/Leadership/Do You Leave Room To Chat? Do You Leave Room To Chat? So I don’t know if you have noticed yet, maybe you don’t have a TV or any form of social media, but there is a TON of things happening around us. People are flooding to social media putting up opinions for all to see (which is not a bad thing, everyone has that right). My mind goes to the question, “What does this mean for my ministry and my students?” because I don’t doubt they are seeing a bunch of different articles being posted left and right about a whole bunch of things and they will have a ton to process and a ton of questions. Where can they do this safely? My hope is in your ministry. One of the safest places on the planet to talk through life, faith and culture should be their student ministry. Developmentally, most don’t have the ability to fully process everything they are hearing, reading and seeing. What does this mean for us youth pastors? It means we need to provide an atmosphere for students to discuss, bring up, and have conversations about what is going through their heads. When students are talking about stuff, it helps them process their thoughts, and when they are processing their thoughts they are growing and learning. One of the best things we can do for our student ministries is to make sure we create a safe place for students to think, bring up doubts and confusions without fear of judgment or fear of ridicule from their pastor and volunteers to begin to walk through some great questions on faith, culture and the doubts and questions that come along with it. If it’s life transformation we are all after in the lives of students it starts with learning about the heart, the desires, the thoughts, the lives of those who are in our care and pointing them back to Jesus. Your service, program, room (whatever you do) should be a safe place for students to talk and process through and we are there to help, guide, pray with them through it all. Side note: All of that could be squashed in two seconds by a “not really thought through” post on social media. They are watching to see how you respond to whatever is big at the time. Jesus was the best at asking questions. Read the through the Gospels and you will see. Questions start conversations and dig into lives and lets people know you care for them and the same goes with students in our youth ministry. Asking our students questions shows we care about what they have to say and we can begin these conversations. Do your students feel like they can approach you with their thoughts, feelings, doubts and struggles? Do you create a space where conversations can happen?